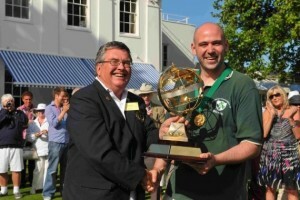 Charles Jones was President of the World Croquet Federation from 2010 until his untimely death in August 2011. He was murdered in Thailand while on holiday, on his way back to his native New Zealand after the WCF Under 21s and GC World Championship in England in July 2011. Charles started playing croquet at the Rangimarie Croquet Club here in Westport when he was nine or ten. He was a regular competitor at the national level from the mid-seventies to early 2000. Charles’ greatest contribution to croquet was on the administration and support side. Charles was the preferred team manager for Trans-Tasman and Mac Robertson Shield teams. Charles’ team management skills were impressive. He was chief cook and bottle washer, mentor and organiser. NZ teams’ success over the last sixteen years owe a great deal to Charles’ commitment and support. Charles convened the association croquet selectors’ panel for many years. He had a good eye for talent and many young players have acknowledged, in recent days, the important role Charles played in their development as elite players. Charles gave the same attention to encouraging and supporting recreational players. Charles held senior leadership positions in the Wellington and Canterbury Associations and was a regular attender at Croquet NZ AGMs. Charles was elected CNZ President in 1999 serving for four years. Charles’ tenure saw the start of CNZ’s moves to establish a strong national office supporting the game throughout the country. Golf croquet was becoming popular and Charles’ efforts made sure that the game became an important part of NZ croquet scene. He played a pivotal role in putting the game’s administration on a more professional basis. Charles’ contribution was acknowledged when he joined the small band of life members at last year’s AGM. Charles’ contribution to international croquet was not limited to managing NZ teams. He played at both golf and association world championships. He refereed and managed at a number of international events from 2002 to earlier this year. It didn’t matter whether Charles was in Cairo, Cheltenham or Christchurch; the room lit up when he came in and the stories started. Charles was awarded his QSM (Queen’s Service Medal) for public services. It could equally have been awarded for services to the community. Not all of us have an opportunity to contribute in as many areas as did Charles. Charles seized all his opportunities and gave it his best. It is not just the croquet world that is better for it. Copyright ©2015 World Croquet Federation.